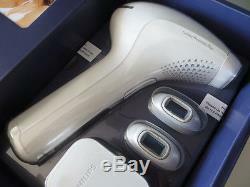 Philips Lumea IPL Hair Removal System SC2008 Body, Face & Bikini w/ 140K Flashes Cartridge. 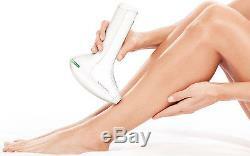 Philips Lumea IPL hair removal system SC2008. TOP OF THE RANGE MODEL. NOW WITH 3 x TREATMENT WINDOWS (Body, face and bikini). + 140.000 flashes + Cordless Slide and flash technology. The ideal way to prevent hair regrowth for smooth skin at home. Philips Lumea IPL is the most effective cordless IPL solution and works wonders to prevent the reappearance of hair on face and body. Gentle pulses of light, applied regularly, keep skin silky-smooth every day. Enjoy smooth skin every day Effortlessly effective Hair removal with IPL technology Adapted for safe use in the comfort of your own home Suitable for a wide variety of hair and skin types Gentle and effective on body, face and bikini Safe and effective even on sensitive areas Bigger body attachment for fast treatment Facial attachment for safe facial treatment Attachment for specialised treatment of bikini area hair Five adjustable light energy settings Maximum freedom, minimum hassle Cordless convenience No replacement parts, no hidden costsSC2008/11. 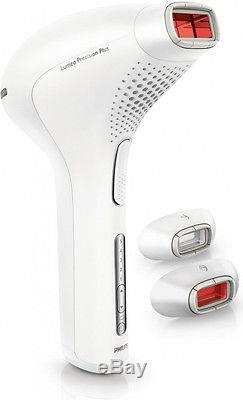 Philips Lumea applies gentle pulses of light to the hair root. As a consequence the hair sheds naturally and hair regrowth is inhibited. Repeating this treatment regularly will keep your skin smooth every day. Our clinical studies have shown significant hair reduction in as little as four bi-weekly treatments resulting in smooth hair free skin. To maintain these results, simply repeat the treatment when needed. Time between treatments may vary based on your individual hair regrowth. Philips Lumea uses an innovative light-based technology called IPL (Intense Pulsed Light), derived from the technology used in professional beauty salons. Philips has adapted this technology for safe and effective use in the comfort of your own home. Philips worked closely with leading dermatologists to develop our breakthrough hair removal system. For more than 10 years we carried out extensive consumer research with more than 2000 women. Suitable hair and skin types. Philips Lumea works effectively on (naturally) dark blonde, brown and black hairs. As with other light-based treatments, Philips Lumea is NOT effective on red, light-blonde or white/grey hair. 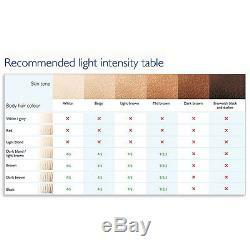 Philips Lumea is also NOT suitable for very dark skin. Use with confidence to remove hair on face (upper lip, chin and sideburns) and body parts including legs, underarm, bikini area, belly and arms. Bigger body attachment for fast treatment on large areas like legs. High performance lamp: Delivers > 140,000 flashes. Safety ring system: Prevent unintentional flashing. 5 light energy settings: Adjustable to your skin type. 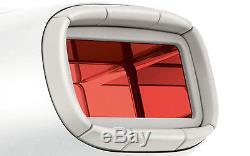 Integrated UV filter: Protects skin from UV light. Body areas: Legs, Underarms, Belly, Bikini. Face areas: Chin, Sideburns, Upper lip. Slide and Flash: For convenient application. Step and Flash: For treatment on curvey areas. Body attachment (4cm2): For use below the neckline. Bikini area attachment (2cm2): Special treatment bikini hair. Facial attachment (2cm2): For safe application on face. Instructions for use: Full user manual, Quick Start Guide. Running time: Minimum 370 flashes. Suitable hair and skin types Philips Lumea works effectively on (naturally) dark blonde, brown and black hairs. 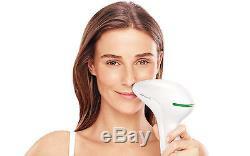 The item "Philips Lumea IPL Precision Plus Hair Removal Device System SC2008 140K Flashes" is in sale since Monday, September 08, 2014.